D E S I G N L O V E F E S T » THESE CATS GOT STYLE! we got two new kittens recently. and they are in that phase where they run around like crazy animals, sliding on the loft floors, risky business style. but they definitely added so much life + happiness to our space. i find myself so excited to come home and see those two little faces. even if they have unrolled all the toilet paper or chewed my computer cords. so doesn’t that litterbox look like an ipod or something? it’s pretty much the coolest litterbox ever! because as you may know, litterboxes are the worst part of having cats. you feel like you are walking around on little dirty pebbles all the time! modkat sent us this white one, and my cats are kinda freaking out about it. they think it’s a tree house or a really fun jungle gym hideout. and YES i am telling you guys about a litterbox, because I have never seen one as well designed as this one. and look at this bed! ha! wow perfect timing for this post! i just got a kitten too and i live in a tiny little studio, so the litter box is perfect! also amazing timing because i just did my own kitten blog post just a few hours ago! omg. I love that litter box. I’m a product design grad and junkie, and that is brilliant design right there! OMG. I want that litter box- I hate, hate, hate the walking on dirty pebbles party of kitty ownership (and I’ve had abou 13 years of it). we HAVE used it. the cats love it. tabitha, i was worried my princess cat wouldn’t climb in, but she loves it. it’s so much less messy, and i don’t have to look at litter all the time. genius! 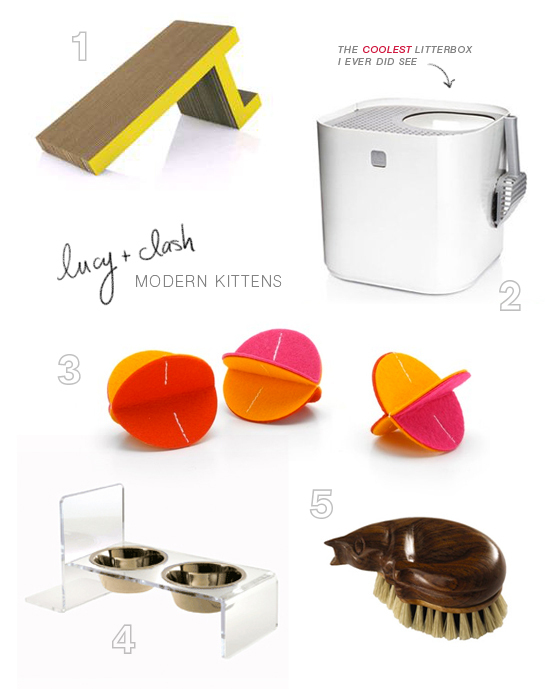 You should check out the stuff I got for my cat, I also have that litter box. You gotta check out the loungers from modpet though. omg shauna! i love all of those! Hi Bri, I am the crazy pregnant woman that accosted you outside cafe stella last weekend. 1st off please excuse my total dork out. I was very excite! Now to cats: there is this bitter apple spray that you can squirt on your cords and the kittens will stay away. It doesn’t hurt them they just don’t like it. We found the spray after having to buy a few new iphone chargers and a computer power cord.You can get it at petco or any pet supply store. Also, I love hearing that people love that litter box. I have been eying it for a while but haven’t made the jump yet. What a great roundup. I have wanted that litter box for a long time, but I think we’re going to set up an outdoor caged area that they can use. I hate cleaning the litter! Bri, you are too excellent for the kind words about ModKat, I just wanted to thank you and let your viewers know we are now (as of today) offering free shipping from http://www.modkat.com. Thanks everyone! I have 2 cats as well, and that exact litter box – purchased it after I was fed up with 2 other ones that were sort of an eye sore. I love it! It’s by far the best one for minimal litter tracking. love the looks of the box but my older cat (14) was unable to deal with it. he has stopped jumping around and cried & cried about it. i bet it’s perfect for a kitten though.